Wondering How to Entertain Your Children Over Easter? Holiday time is great, but if you have children it can also be stressful. Trying to find something for them to do that they will enjoy and keep them occupied is hard, especially something that isn’t too expensive and doesn’t involve being glued to the Playstation. After requests by a number of clients, the Easter Tennis School is here. 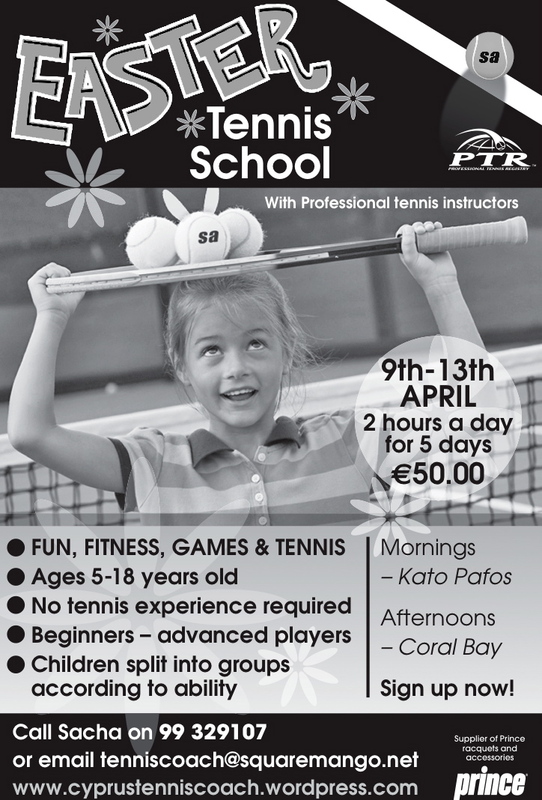 It’s 2 hours a day of tennis, fitness, games and fun for 5 days from 9th to 13th April for just €50 per child. Children aged 5-18 years old can take part and it is suitable for both complete beginners and more advanced players – the classes will be grouped into children of similar playing abilities and/or ages. The classes will be held in the mornings in Kato Pafos and in Coral Bay in the afternoon. You will register for a particular location, but you can request to mix and match, as long as it adds up to 5 x 2 hour Easter Tennis School sessions. If you’re interested, please contact Sacha ASAP. This entry was posted in Cyprus Tennis Coaching, News and tagged Aphrodite Hills, Baghdatis, Children Tennis Coaching, Cyprus, Cyprus Tennis, Cyprus Tennis Coach, Cyprus Tennis Federation, Learning Tennis, Play Tennis in Cyprus, Tennis, Tennis Academies in Cyprus, Tennis Academy, Tennis Centre, Tennis Club, Tennis Clubs in Cyprus, Tennis Clubs in Limassol, Tennis Clubs in Paphos, Tennis Coaching, Tennis Courses, Tennis Equipment, Tennis Holiday, Tennis in Cyprus, Tennis in Limassol, Tennis in Pafos, Tennis in Paphos, Tennis Lessons Cyprus, Tennis Lessons in Cyprus, Tennis School, Tennis Tournaments in Cyprus, Womens Tennis by Paphos Tennis Coach. Bookmark the permalink.